Witches now have their own charmed emoji to use with iMessenger, thanks to Pam Grossman, a Brooklyn-based writer and curator who focuses on witches, magic and esoteric art. Working with an emoji designer who created the icons based on her designs and direction, she then built the app herself. Costing $1.99, it launched early April 2017. The iMessage sticker pack is compatible with iPhones and iPads with iOS 10.1 or newer. WitchEmoji’s 80 images include a besom, cauldron, Book of Shadows, pentacles in all colors, a chalice, a candle, an owl and a love potion along with witches of all hair and skin tones in a variety of situations from flying on a broom to honoring the full moon. Explicit directions on how to download and load the emoji can be found at https://www.witchemoji.com/. Grossman’s blog, Phantasmaphile, can be found at Pamgrossman.com. She is the associate editor of Abraxas International Journal of Esoteric Studies, co-organizer of the Occult Humanities Conference at New York University, and co-founder of the former Brooklyn arts and lecture space, Observatory, where her programming explored mysticism. Grossman’s writing has appeared in “Sabat Sciences Occults,” “Huffington Post,” and MSN. Lectures include such topics as the occult in modern art and female magic in Western , and she also teaches classes on spellcraft, ritual and herbalism. 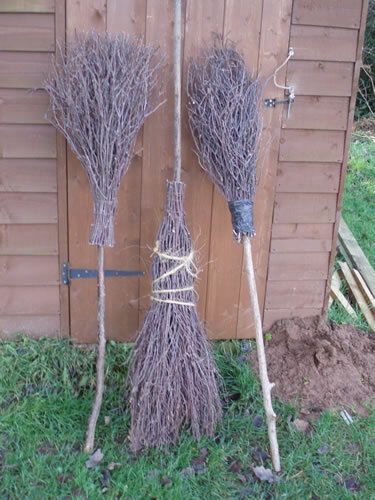 The besom is a traditionally constructed broom. They are an item some people choose to keep around for various reasons. Of course, the meaning has changed significantly over time. Unlike a regular broom, a besom should have a rounded brush instead of flat. This is because the straw should be wrapped around the pole. You can buy them in a store, but they are relatively simple to make on your own. They are best made with an ash staff, birch twigs for the brush and bound with willow. This option give you the best protection, healing and love. 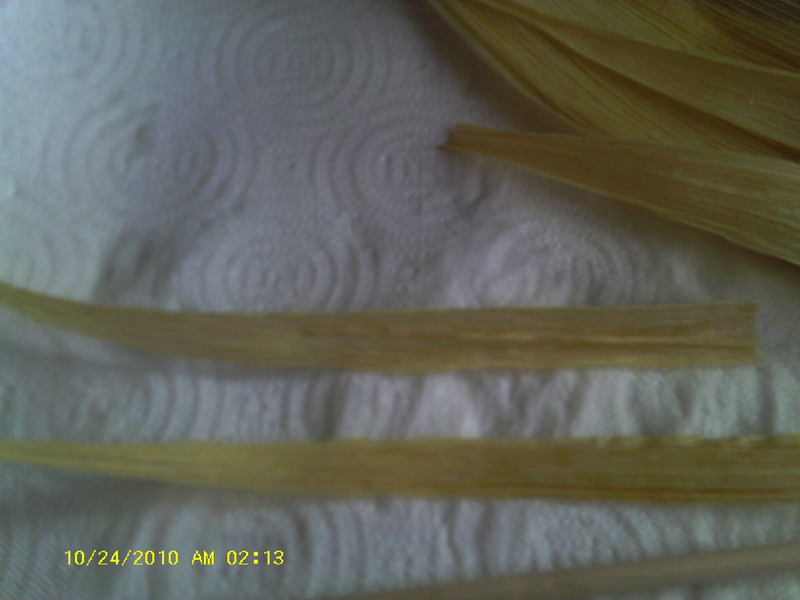 Straw is another common item for the brush. The three items are symbolic of the triple aspect of the Goddess. Ash represents one’s ability to work with the four elements. Birch draws spirit to one’s service, and the willow is connected to the dark Goddess’ energy. In some lore the besom would contain 6 different woods- willow, broom, hawthorn, birch, hazel and rowan. Midwives of ancient Rome used special brooms to sweep the threshold of the house after childbirth. This was to cut the ties between the world of the living and the realm of the dead. It was believed that the child had entered from the world of the dead and the pathway should not be made easy for a quick return. Since around 1336 B.C, Egyptian priests swept the ritual area then sprinkled it with blessed water. This ancient tradition is in a way still used since in modern practice, a large besom is used for cleaning the area before a circle is cast. Sometimes a besom is lain across the edge of the circle to serve as temporary closure. 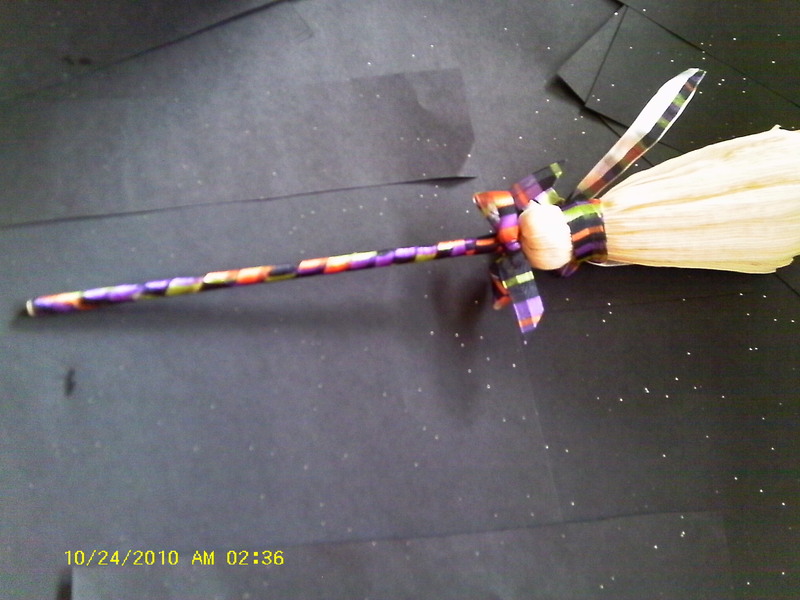 Crossing brooms at quarters, and then symbolically uncrossing them, had been used to allow quarter energies into the cast circle area, while nailing crossed brooms to your front door or wall is said to guard the house and disperse negative energy. Brooms are used to banish unwanted energies, send the dead back to slumber land and work weather magic. 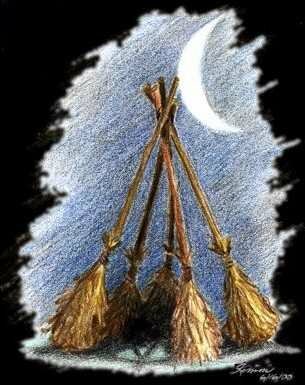 Besoms were used for Pagan weddings as couples would “jump the besom” to symbolize their union. This is literally jumped during a hand fasting to signify the leap from one “life” to the next. Besoms might not have as much meaning now as they used to, but I think that they are still important in casting a circle as it is always better to have a cleansed area then not. Welcome to the Samnhain edition of Thrifting the Witchy Way! The fabulous Jenn ( round of applause for the hard working staff here- they deserve it and more!) has promised me that the pictures from our last installment should be up this time around so please take a look at that so that you don’t think I’ve been doing imaginary projects! 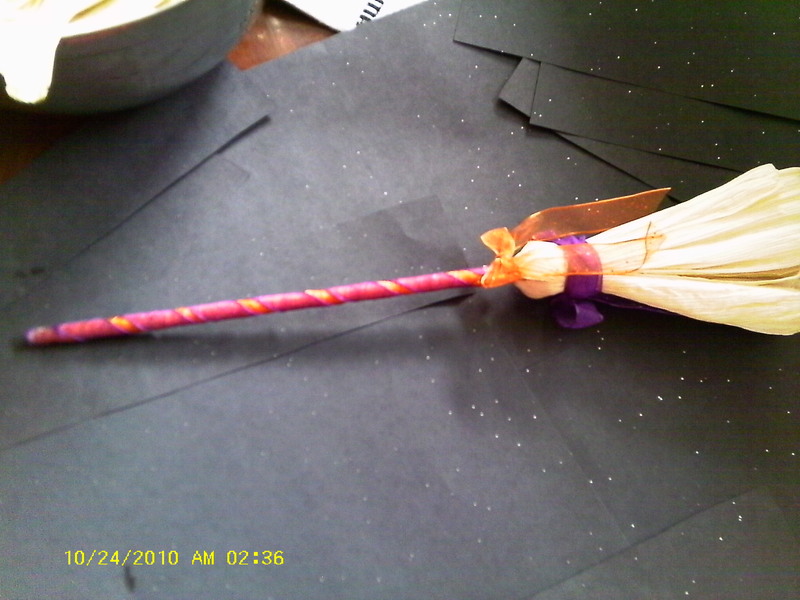 So for my first Samhain (or for those of you out there who go a bit more secular- Halloween) edition of Thrifting the Witchy Way I thought I would keep it light and bring you one of my favorite crafts –Miniature Witchy Brooms! Now this project is a ton of fun for witchlets of all ages (This time of year certainly makes me feel like a kid again!) and is absolutely fantastic for hostess gifts, party favors, kids craft time, or just to decorate your own witchy pad! 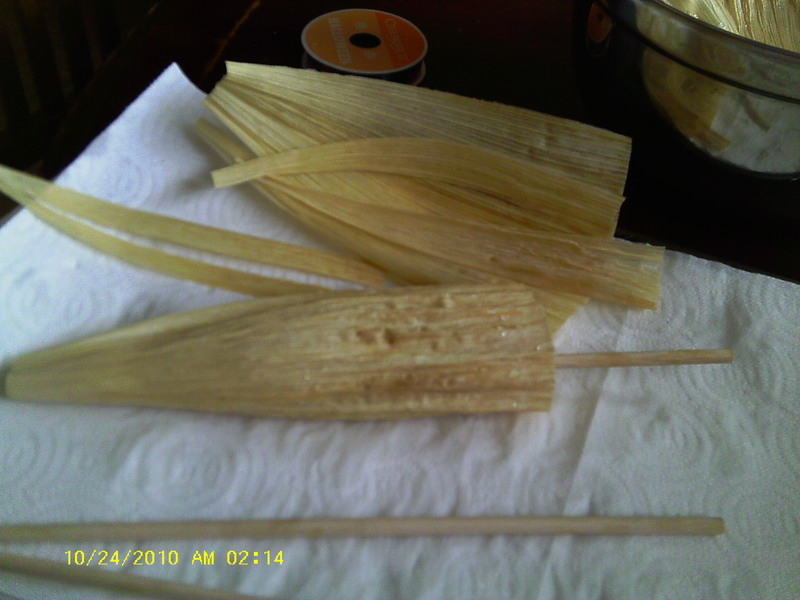 Soak the corn husks in the bowl of water until they are soft and pliable. 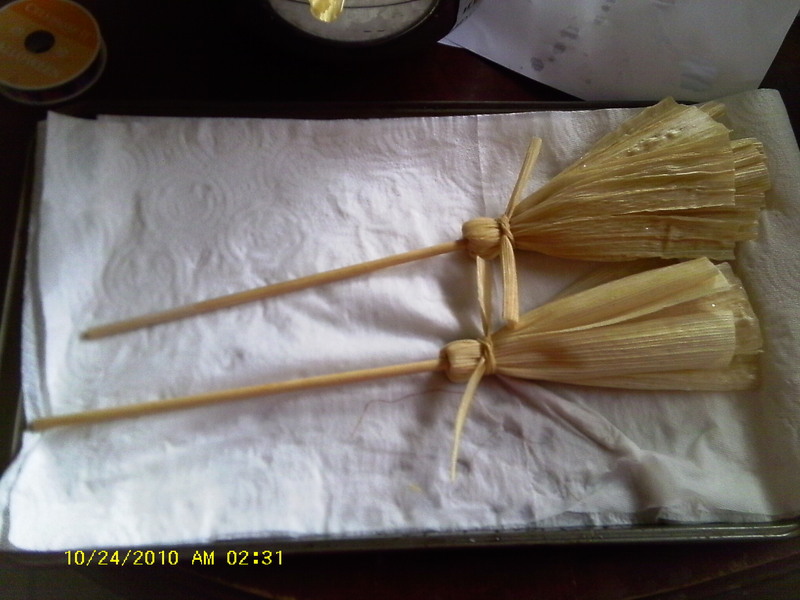 Start wrapping the corn husks around one of the dowels with the thin end lined up to the end of the dowel, leaving the wide end laying along the length of the dowel. Using one of the thin strips of husk; tie the strip around the thin ends about 1/4 of an inch from the end of the dowel. Push the dowel down until about another 1/4 inch is showing below the husks. 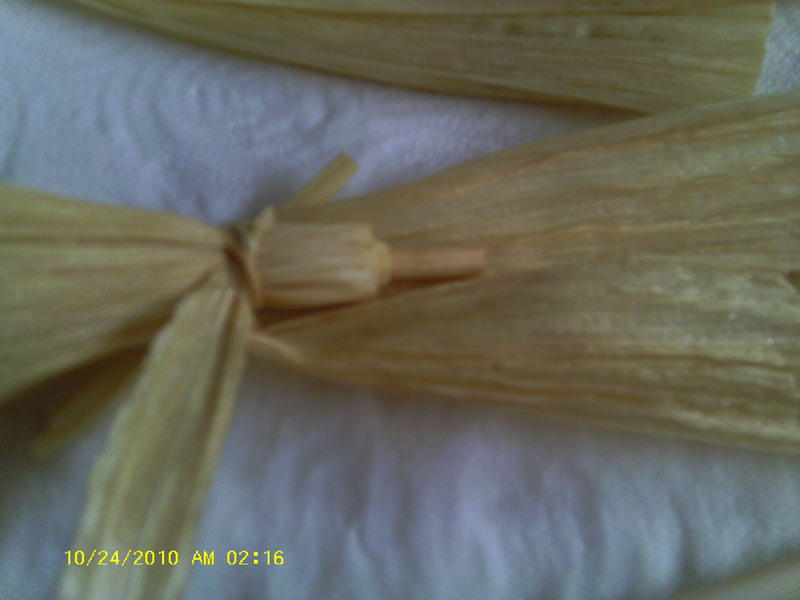 Now begin to fold the husks down over the tie, until the other end of the dowel is now clear of husk and the end that you just pulled down in Step 5 is now hidden in the husks. 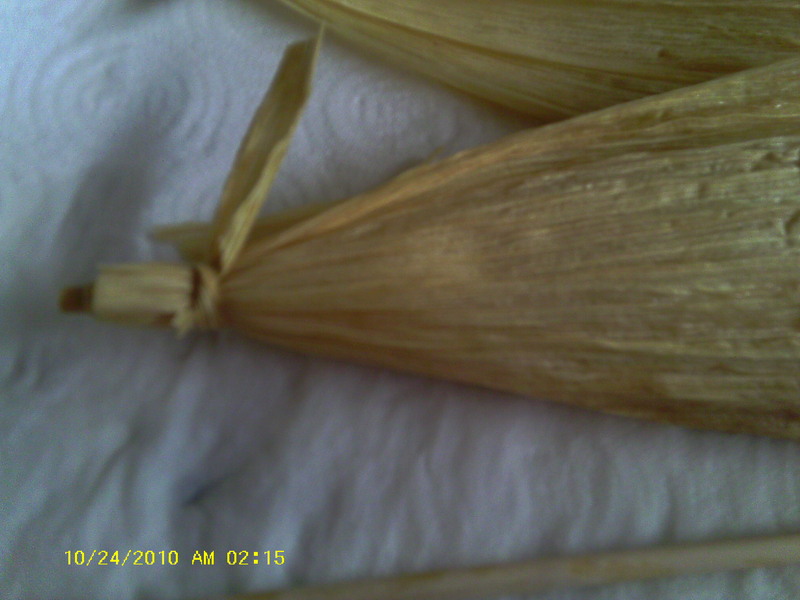 This is a good time to tear the husks so that they seem fuller and more broom like. 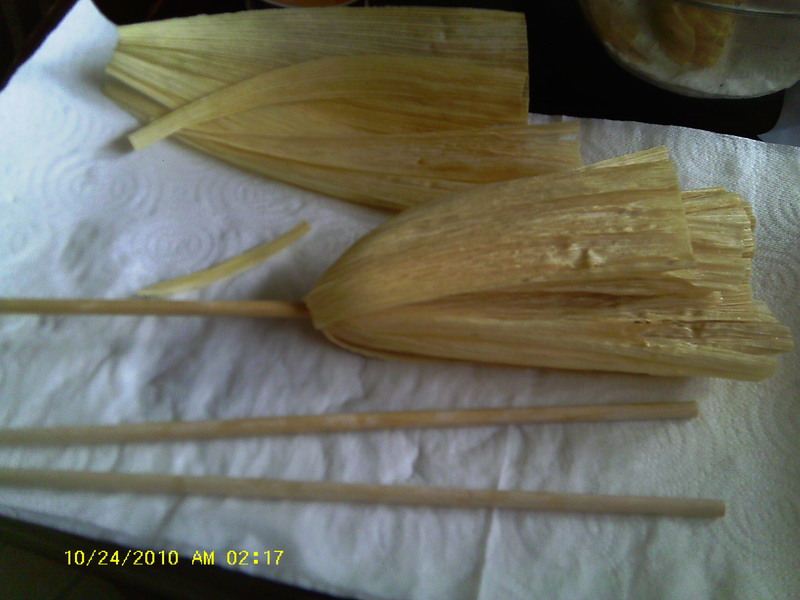 You’ll use your other thin strip and you will tie the strip around the husks about 1/2-1 inch below where they meet the dowel. This will really make it look like a broom. Let them dry. I suggest over night, sometimes longer if you have a particularly thick set of husks. 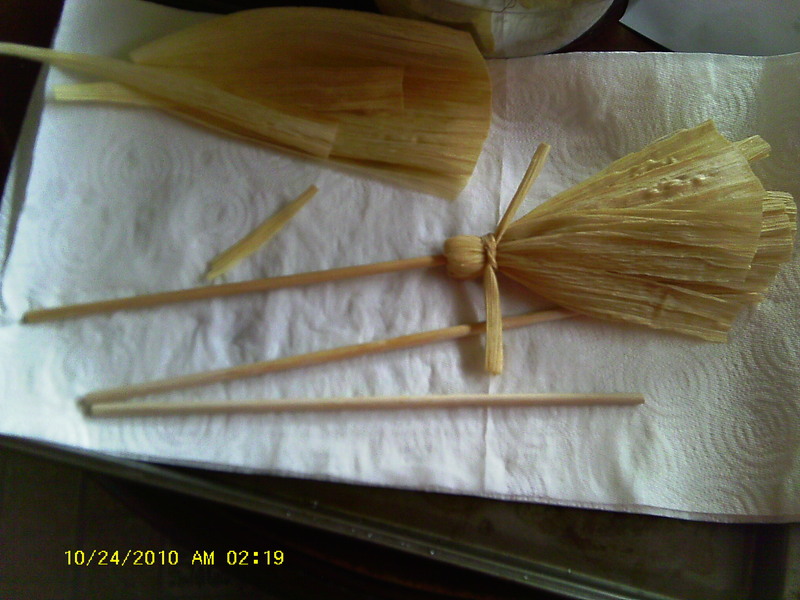 Usually, as soon as they are dry, use a hot glue gun to glue the upper (folded over) part of the broom to the dowel ensuring that it won’t move around. This one I used a patterned ribbon on and it looks a bit more country witchy. If I’m going to use this as a gift or a decoration I also like to add a little folded envelope(you can find a great tutorial on the one I use here) and stuff the little pockets with protective symbols or small stones, or anything that sets my purpose. 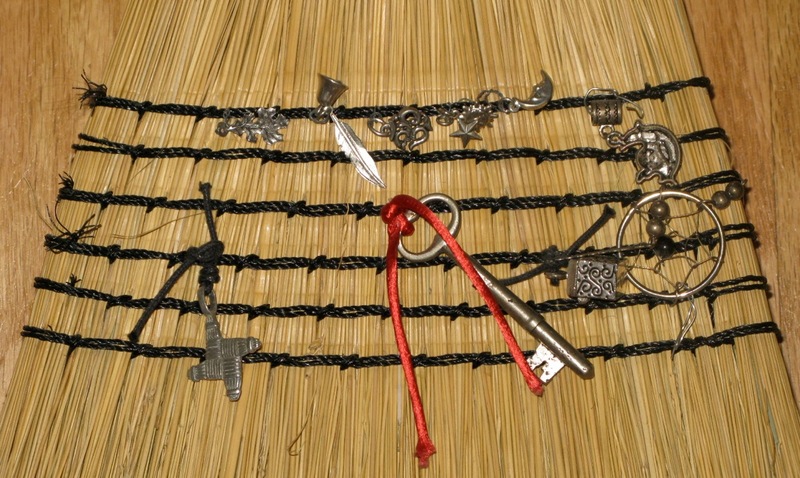 I then punch holes in the top and string a ribbon through it and hang them from the brooms. These can be just simple decorations, or you can charge them with intent and hang them as charms, or you can even use them as home made altar besoms for those of us who have limited ritual space. Also herbs or potpourri can be put into the envelope or can be hung from inside the “bristles”. Painting or drawing on the bristles is also a great way to customize them. It’s one of those multi-purpose crafts that I, and my pocket book, love! And keep your crystal balls tuned in for our next installment of Thrifting the Witchy way as I’ll show you one way to make your very own Thrifting Journal for all those prowls through the thrift shops. So see you next time- same witchy time, same witchy channel!